There are a lot of decisions to make when it comes to choosing LED lights. You have to consider the bulb, wattage, color temperature, and more. One thing to consider when picking new LED lighting is whether a dimmer is applicable to your space. If so, what type of dimmers are available for LED lighting? 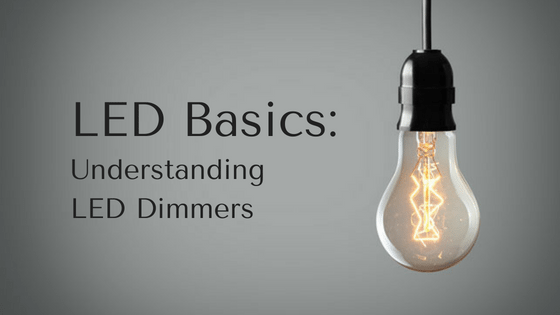 Today, we are going to look into LED dimming, how it works, and which option is best depending on your LED bulbs and application. If you are installing smaller LED lights to tubes, Triac dimming may be your best option. This type of dimmer works similarly to traditional dimmers, by reducing the current sent to the bulb with a wall switch. However, this type of dimmer won’t work on LED tubes with external drivers. It is important before installing LED to make sure the bulbs will be compatible with the dimmers, otherwise, the bulbs will prematurely fail and you’re back to square one. 0-10V dimming is used most commonly on larger LEDs, typically in commercial and industrial settings. These dimmers, however, do not use a wall switch. They use external controls that can be pre-programmed to dim when motion detectors are not triggered or turn off completely at a specific time. You install these dimmable lights to replace high bays, wall packs, area lights, street lights, etc. Find the Best Bulbs and Dimming Options at Sitler’s! When working with Sitler’s to install LED lighting, you will find the best bulbs and the best dimming solutions. You work one-on-one with a lighting consultant to find the right lighting solutions for your space. Give us a call at (319) 653-2123 or request a quote online.